April 15th, 2012 by Margie B. in Walkthroughs. 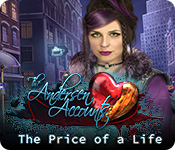 A young woman is attacked in the middle of the night inside a locked room. 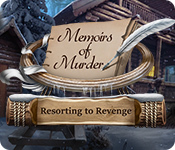 How did the murderer escape? 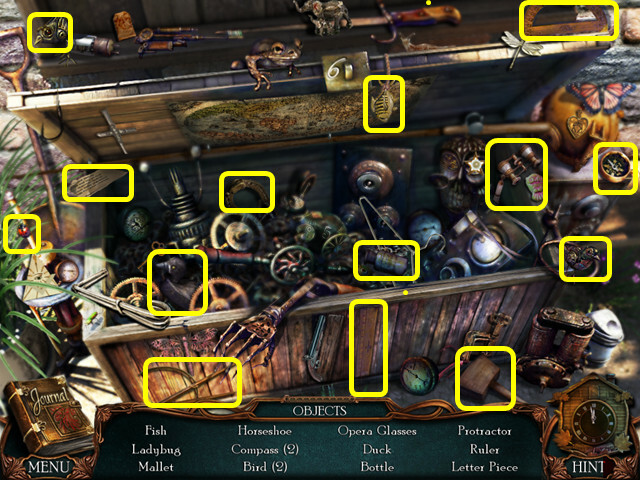 This document contains a complete Victorian Mysteries: The Yellow Room game walkthrough featuring annotated screenshots from actual gameplay! 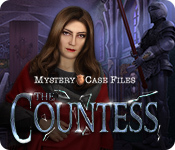 • Hidden Object Scenes and mini-games are often randomized – your solution may vary. 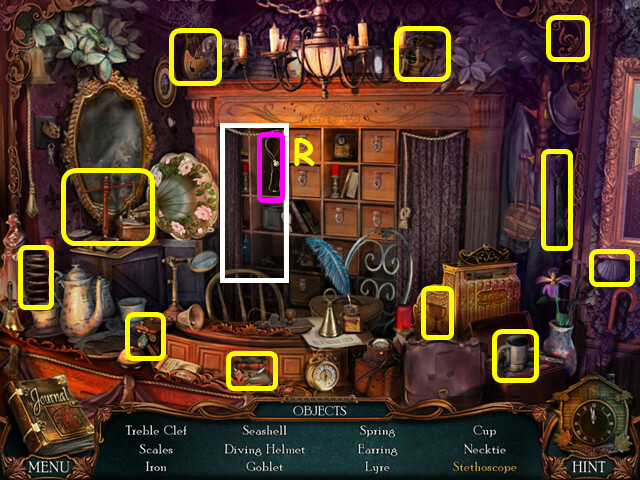 • Hidden Object Scenes will be referred to as HOS in this walkthrough. 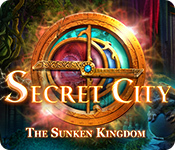 • Hints are unlimited, but you must wait for the meter to refill. They are only available in HOS. • Items in yellow require additional steps. 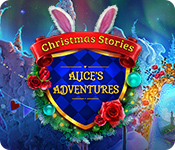 • Read your journal to review evidence and characters (A). 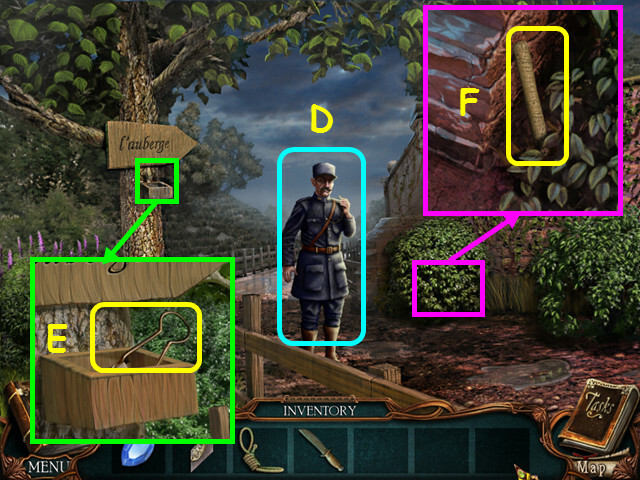 • Select a piece of evidence or character to get more information (B). 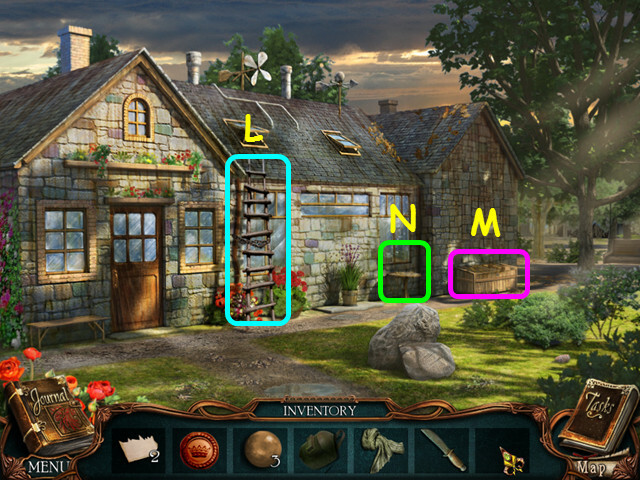 • Your inventory is in the bottom panel – select an item to choose it for use (C). 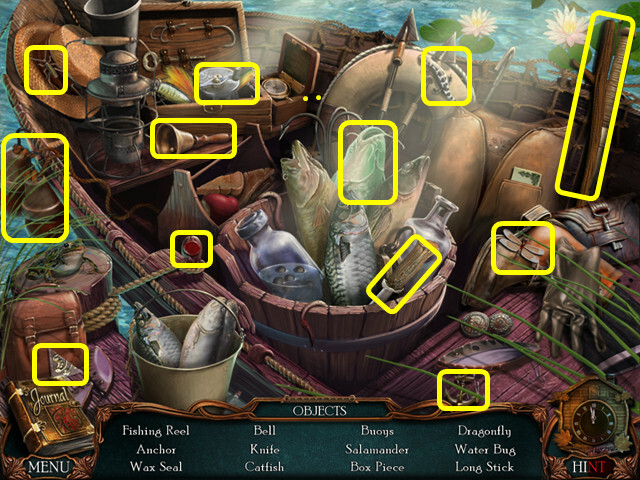 • The inventory panel auto-hides, move your mouse down to reveal the panel. • Select the Map button for your current location (E). • Use the map to determine your current location; you are the yellow arrow (F). 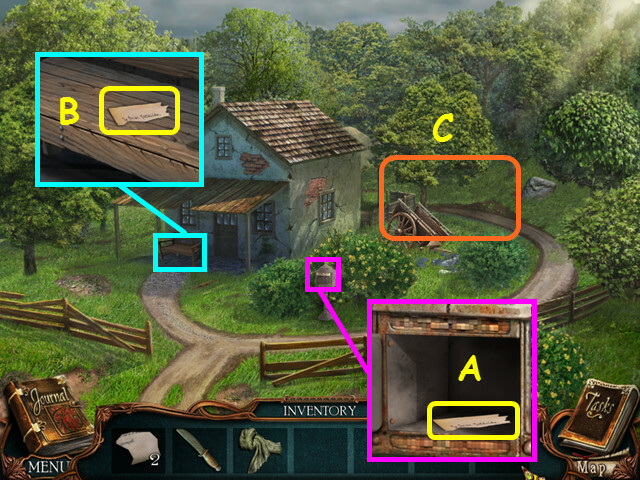 • Selecting the name of a location will also bring up the task list (G). 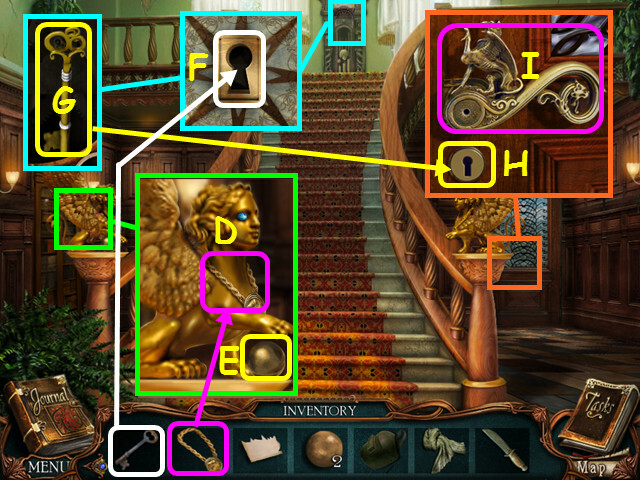 • The task list will give a more detailed map of the area to include the locations of interest (H). 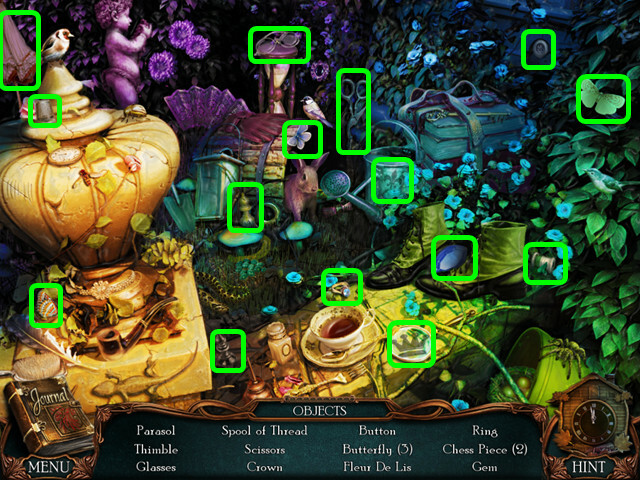 • Refer to the legend to see where HOS and other areas are located (I). • Note that some HOS may need to be triggered and will not be immediately available. 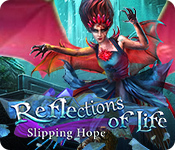 • You will have the option of some interactive help. • During conversations, select the question or statement you wish to speak (A). • Previously asked questions will have a red line through them (B). 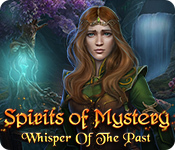 • This guide will assume you have completed all future dialog. 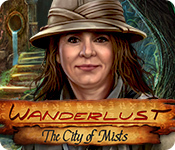 • Look at and open the briefcase on the left; take the map (C). 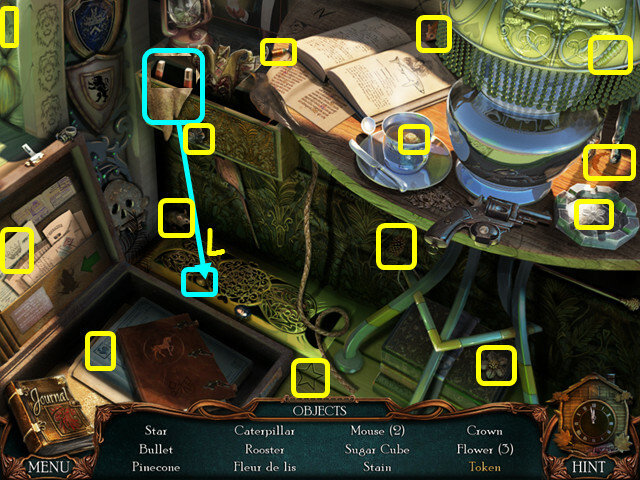 • Look at the box in the center and press the button (D). • Take the 1/2 PAPER CARD (E). 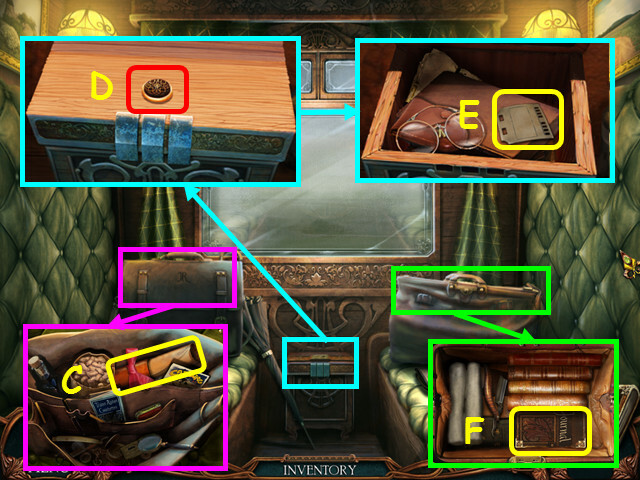 • Look inside the bag on the right and take the journal (F). • Walk down to exit the compartment. • After you are shot at, walk forward to the back door. • Look at the coat and take the 2/2 PAPER CARD (G). 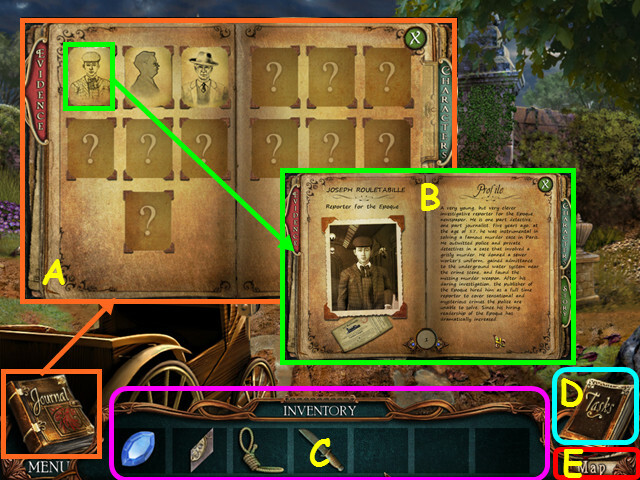 • Look at the device below the coat and place the 2 PAPER CARDS on the right (H). 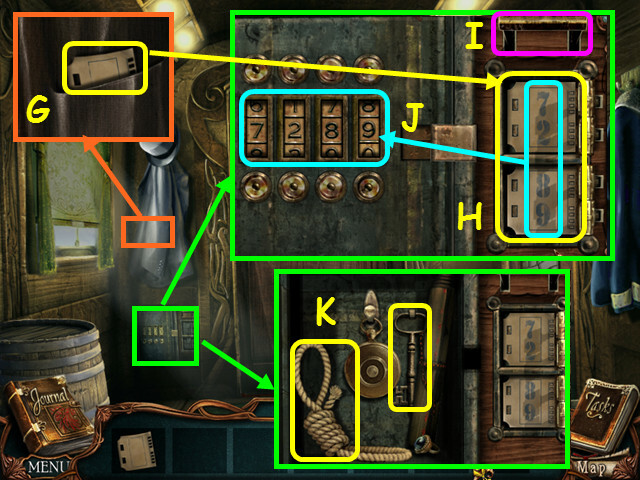 • Pull down the lever to reveal the safe code on the paper cards (I). • Enter the code on the left; 7-2-8-9 (J). • Take the ROPE and the KEY from the safe (K). • Walk down once to the hallway. 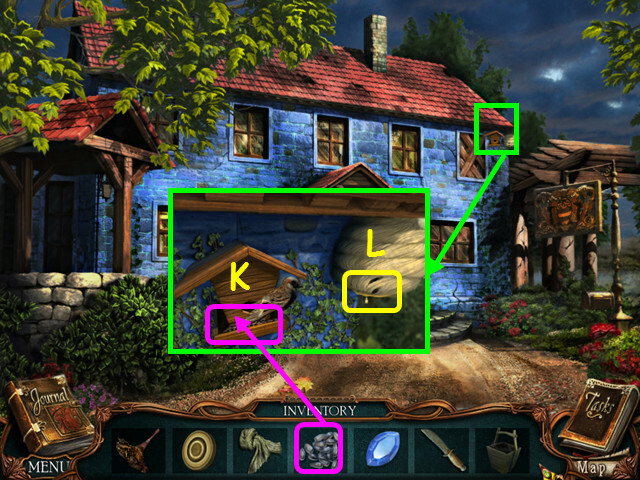 • Select the area under the right window for a HOS. 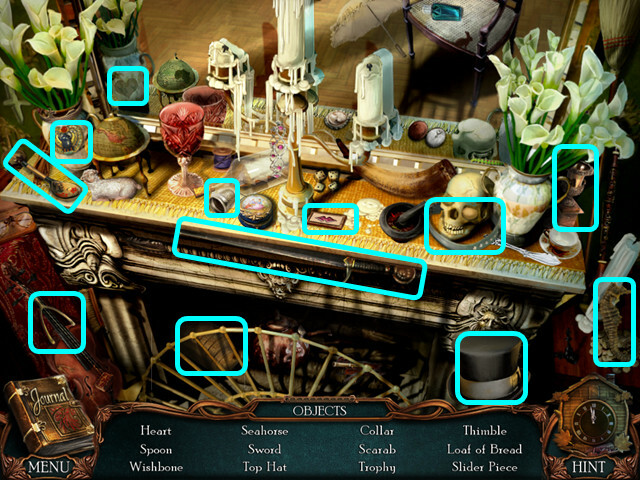 • Locate all the items on the list. 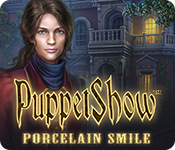 • Remove the cloth, take the magnet and use it on the grate to get the token (L). 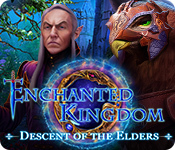 • You will earn the TOKEN. • Walk forward to the back door. • Look at the baggage door; use the KEY in the lock, then turn the key (M). • Use the TOKEN to remove the 4 screws (N). 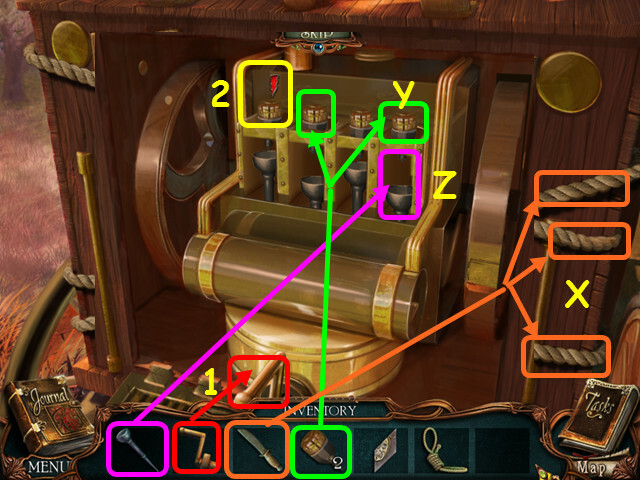 • Drag the 4 gears to the pegs to connect to the locks spring (O). • Find the correct sequence to push the tumblers down so they all stay down. • Walk forward twice to the luggage car. • Look in the suitcase on the left and take the FILE (P). 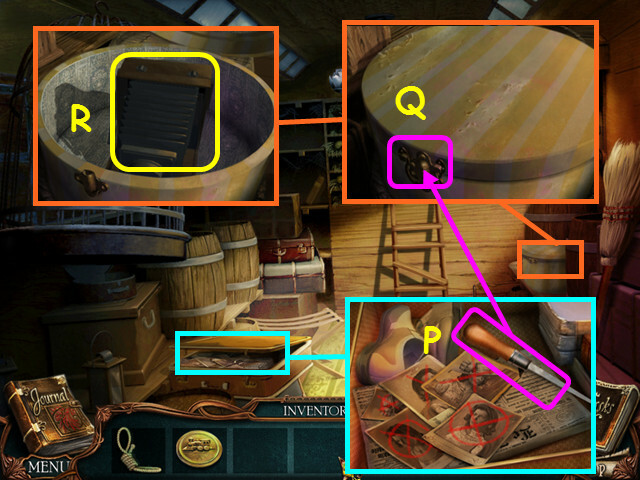 • Look at the hat box and use the FILE on the hasp (Q); take the camera (R). • Your cursor will now change to a camera when you need to take a photo. • Walk down 4 times. • Take a picture of Rouletabille (S). 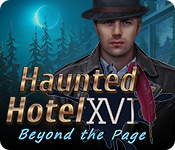 • Make sure to take photos of evidence and characters to fill in your journal. 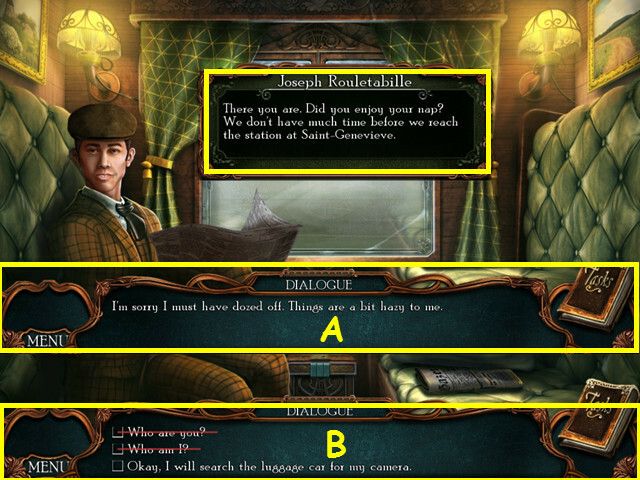 • Select Joseph to eavesdrop on the compartment. • Walk down, forward, then go right to the train station (T). • Look at the schedule and note the time (U). 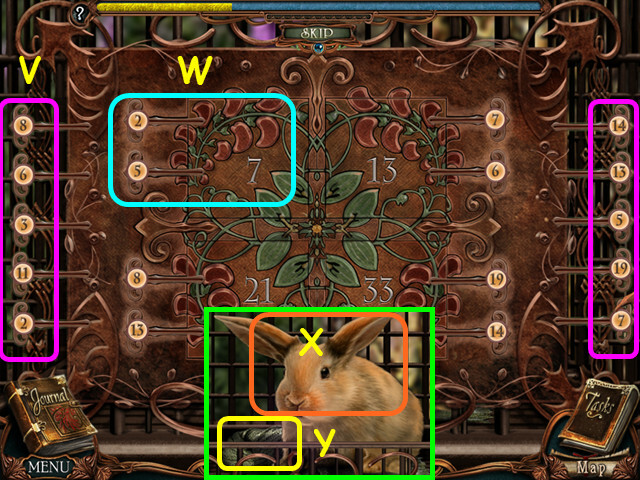 • Pull up the bottom left corner and take the CLOCK HAND (V). • Enter the station (W). • Look at the rip in the seat and take the 1/3 BOX PIECE (A). • Look at the newspaper, take a photo, then take the 1/2 SPARKPLUG (B). • Note the entrance to the ticket booth (C). 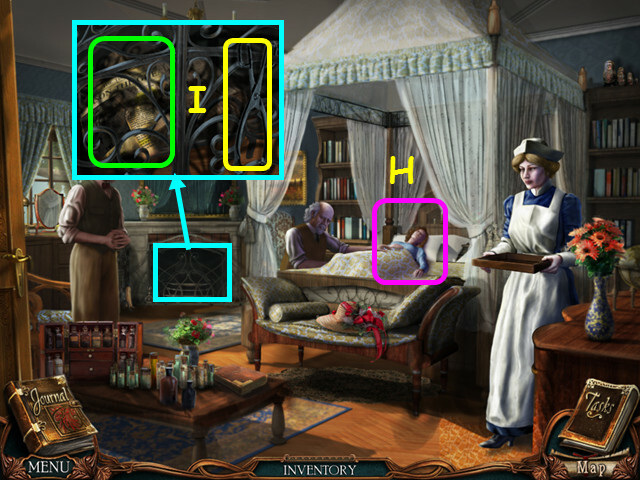 • Select the painting for a HOS (D). • You will earn the 1/3 APPLE. • Enter the ticket booth. 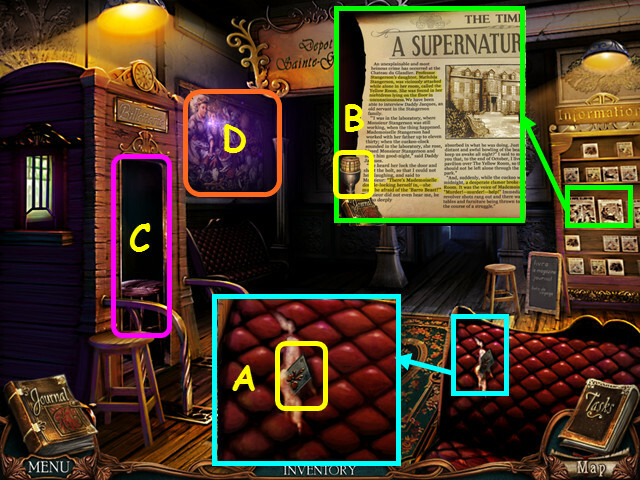 • Look at the newspaper and take a picture of the article (E). • Take the 2/3 APPLE (F). • Look at the brick and photograph the note (G). 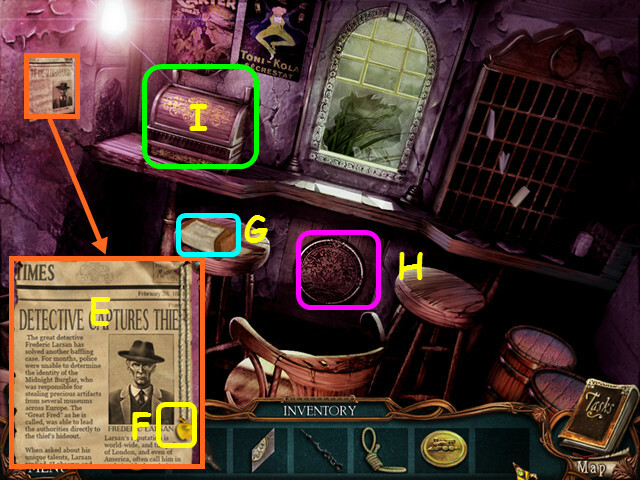 • Note the mini-game under the counter (H). 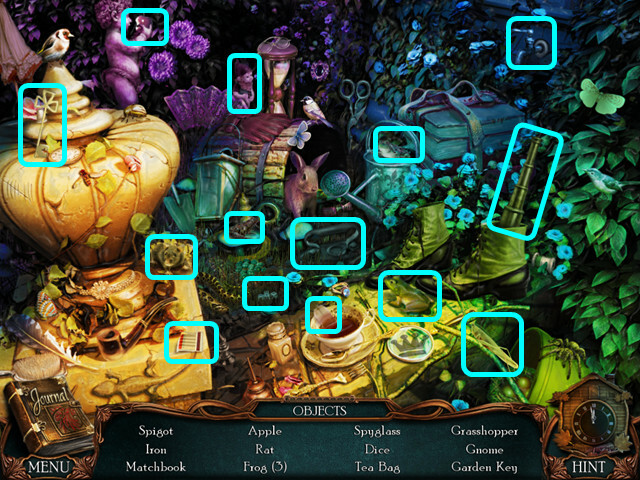 • Look at the register for a mini-game (I). 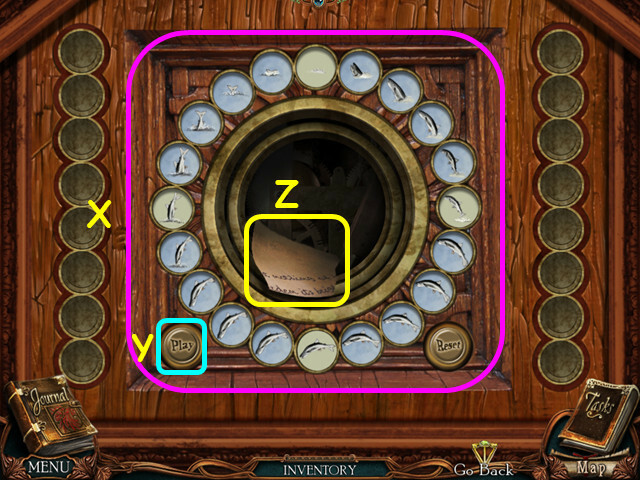 • Place the token in the slot on the right to activate the mini-game (J). • Push all the buttons down; some buttons affect others. • Push 1-2-3-4 to open the drawer. • Take the 2/2 SPARKPLUG (K). • Exit the ticket booth and go forward to the back of the station. • Take the BUCKET of RAINWATER (L). • Take the LADDER (M). • Note the front end of the car (N). • Walk down twice to the front of the station. • Use the BUCKET OF RAINWATER to put out the fire in the bin (O). • Use the LADDER on the clock’s pole (P). 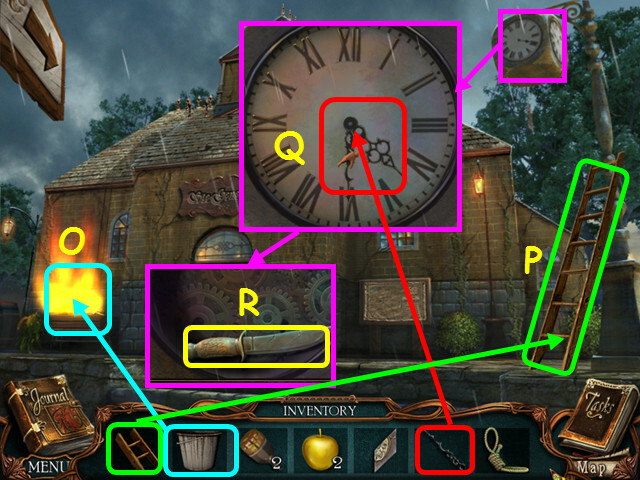 • Look at the clock and place the CLOCK HAND in the center (Q). • Set the clock to 4:30. 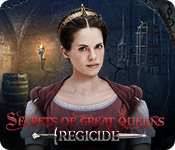 • Take the KNIFE from inside the clock (R). • Select the bin for a HOS. • You will earn the 3/3 APPLE. • Enter the station, then the ticket booth. • Select the mini-game under the counter. • Rotate the rings to restore the carving (S). • Place the 3 APPLES in the indentations (T). • Take the MALLET and the CRANK (U). • Look at the barrel on the right and use the MALLET 4 times on the lid (V). • Take the PISTON (W). • Return to the back of the station and look at the front of the car. • Use the KNIFE to cut the 3 ropes (X). • Place the 2 SPARKPLUGS into the holes near the top (Y). • Place the PISTON in the empty space beneath the sparkplugs (Z). • Use the CRANK on the hole at the bottom (1). • Turn the crank to start the engine then select each sparkplug when the meter above it is full (2). • You will have to restart the engine should you click in error. • Note there is a place to assemble something in the car (A). • Talk to the guard to learn you are not permitted entry (B). 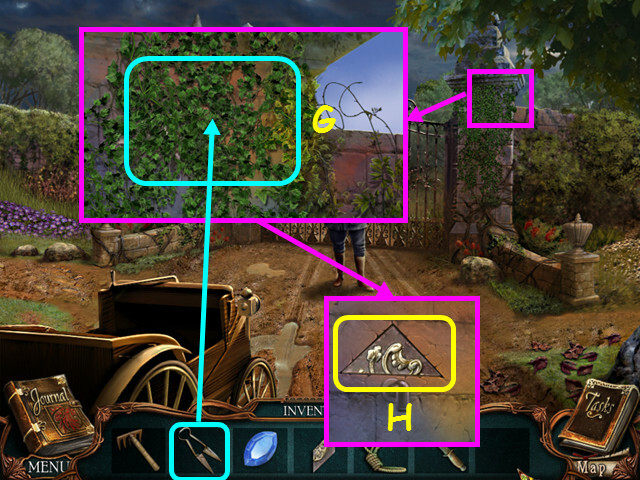 • Select the garden area next to the gate for a HOS (C). 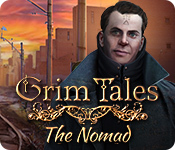 • You will earn the GEM. • Walk to the left. • Try to talk to the guard (D). • Look at the container and take the CLIPPERS (E). 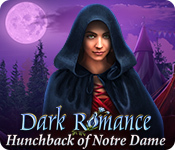 • Look in the bushes and take the RAKE (F). • Walk to the right. • Look at the right column and use the CLIPPERS 5 times on the vines (G). • Take the 2/3 BOX PIECE (H). • Look at the sign and take the LATCH PIN (I). • Note the box hanging overhead (J). 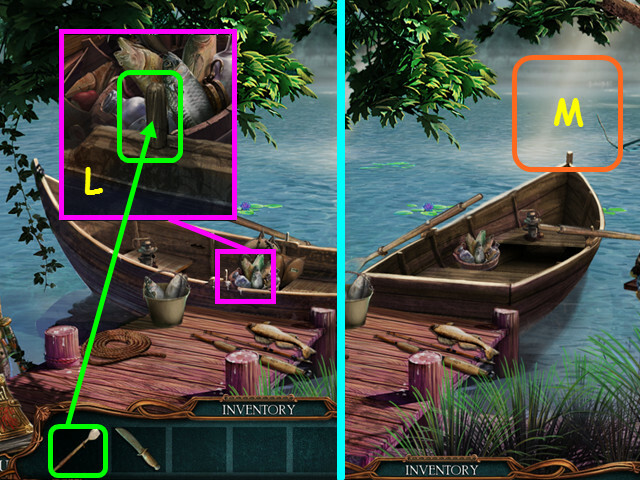 • Note the mini-game on the right (K). 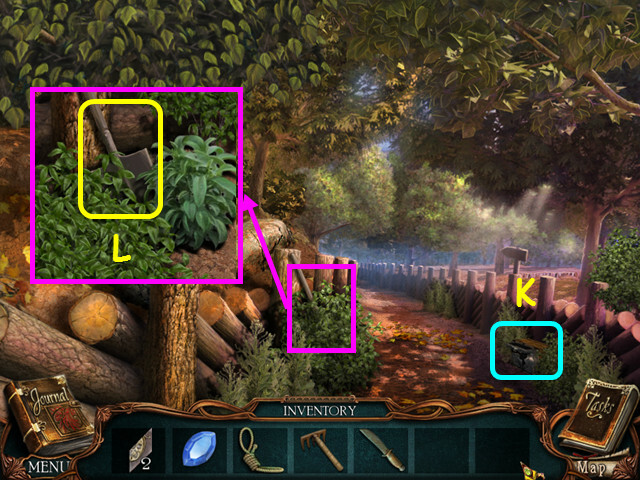 • Look at the bushes and take the SHOVEL (L). • Walk forward to the lake. • Look at the claw in the tree and take a photo (M). • Look at the clown and take the CARROT (N). • Select the boat for a HOS (O). • You will earn the LONG STICK and the 3/3 BOX PIECE. • Walk down once and look at the mini-game on the right. • Place the 3 BOX PIECES on the lid to trigger the mini-game. • Drag pieces into position to complete the lid of the box; select pieces to rotate in place (P). 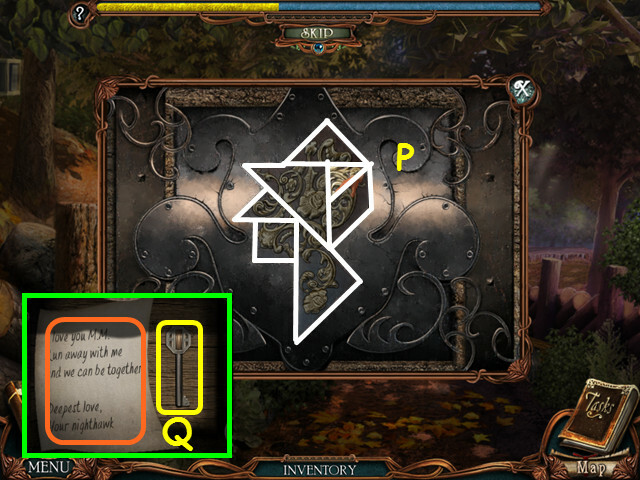 • Take a photo of the note and take the MAIL KEY (Q). • Walk down twice and look in the car. • Place the LONG STICK, RAKE, and ROPE on the seat (R). • Move the rake to the top of the stick, then tie the pieces together with the rope (S). • Take the LONG RAKE. • Take a photo of the cage (T). 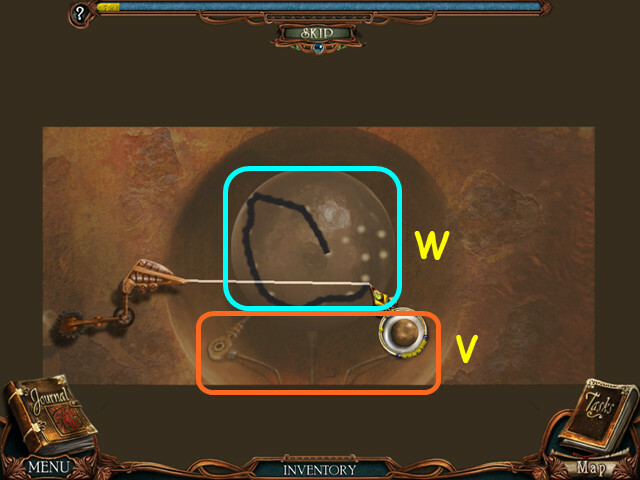 • Look at the cage and place the LATCH PIN on the right to trigger a mini-game (U). • Take latch pins from the sides (V) and place them in the grooves so the numbers on the pins equal the number in the square (W). • Give the CARROT to the bunny (X) and take the SCARF (Y). • Walk right twice, then go forward. • Use the LONG RAKE to knock the box closer (A). 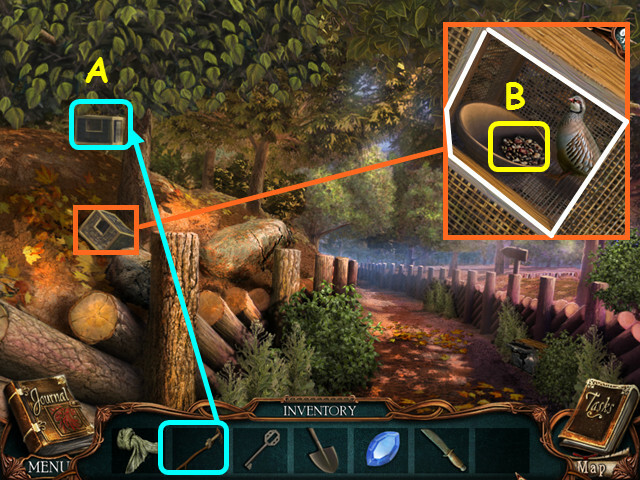 • Look at the box, remove the door and take the BIRD SEED (B). • Walk down twice; go left, then forward to the Inn. • Take a photo of the innkeeper’s wife (C). • Look at the mailbox and use the MAIL KEY on the lock (D). • Photograph the note and take the SAFE DIAL (E). • Note the well (F). • Walk forward to enter the inn (G). • Take a photo of the innkeeper (H). • Walk down 6 times to return to the front of the train station. • Look at the schedule to see that the train from Calais should arrive at 4:54 (I). • Select the bin for a HOS (J). • You will earn the WELL BUCKET and the FEATHER DUSTER. • Walk forward 3 times, go left, forward and enter the inn. 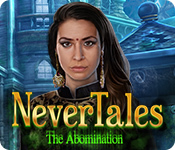 • Talk to the innkeeper again to learn he wants honey. • Walk down once to exit the inn. • Look at the eave and place the BIRDSEED on the feeder (K). • Take the HONEY from the hive (L). • Enter the inn and give the HONEY to the innkeeper (M). • Look at the window and use the DUSTER 4 times to remove the dust (N). • Take the 1/3 LEAD BALL (O). • Note the safe (P). 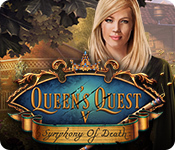 • Select the area behind the counter for a HOS (Q). • Open the curtain to find the stethoscope (R). • You will earn the STETHOSCOPE. • Open the cover and zoom into the safe for a mini-game. 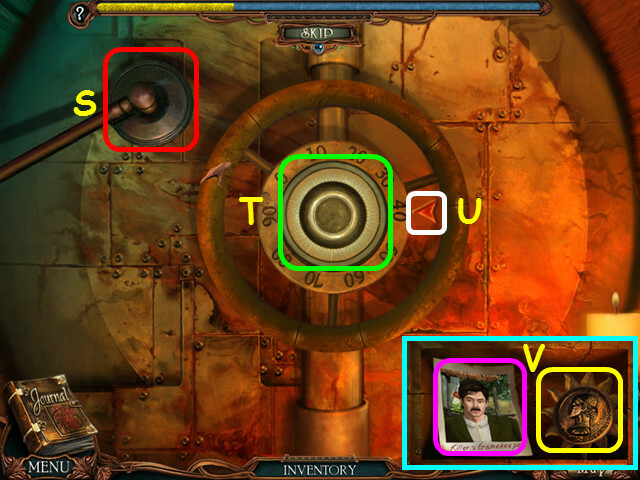 • Place the STETHOSCOPE (S) and the SAFE DIAL (T) on the safe to trigger the mini-game. • Turn the dial until the arrow turns green (U), then release the dial. • Do this 2 more times to open the safe. 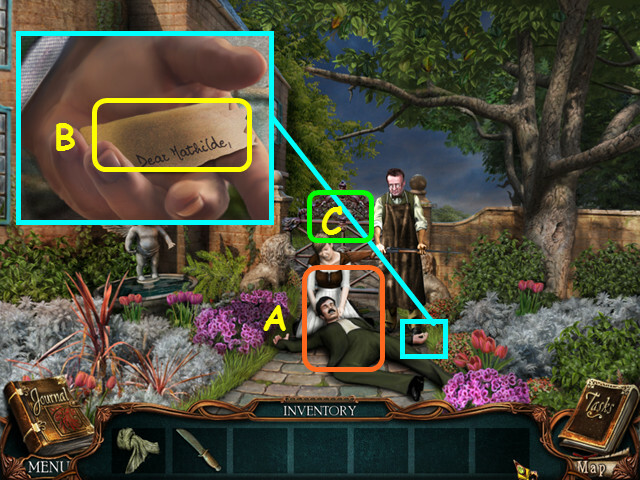 • Photograph the gamekeeper’s picture and take the MEDALLION (V). • Exit the inn and look at the well. • Place the MEDALLION in the center of the well cover (W). 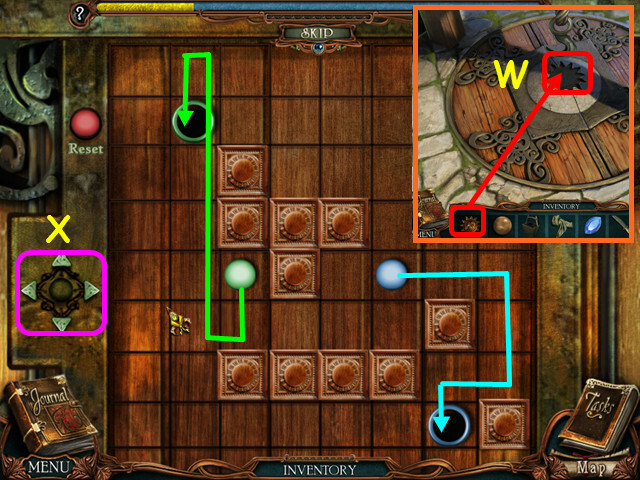 • Use the arrows (X) to move the balls into the matching colored holes at the same time. • Press the arrows: right x 2, down x 2, left, up x 5, down. • Place the WELL BUCKET (A) on the hook to retrieve the WELDING MASK (B). • Walk down, then go to the right twice. • Select the men to eavesdrop on their conversation (C). • Walk down once then go forward through the gate (D). • Note the open window (A). • Take the 1/4 CARD (B). • Walk right to the garden (C). • Note there is something in the tree (D). • Note the locked gate (E). 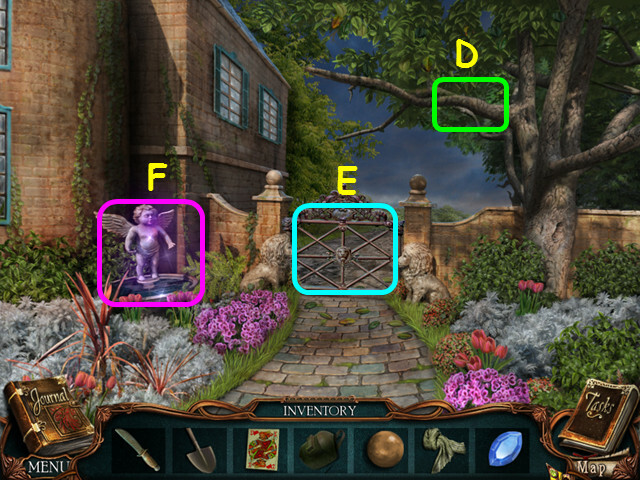 • Select the fountain for a HOS (F). • You will earn the MOON CLOCK PIECE. • Walk down, then enter the chateau. 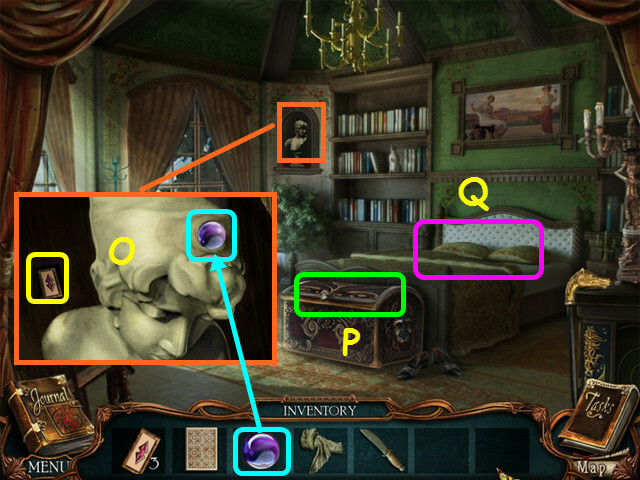 • Look at the right griffin and place the gem in the eye socket (G). • Take the 2/3 LEAD BALL (H). • Note the locked door on the first floor (I). 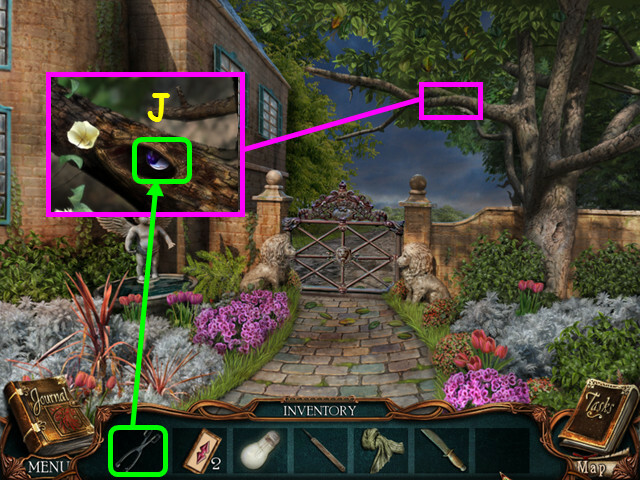 • Select the clock for a mini-game (J). 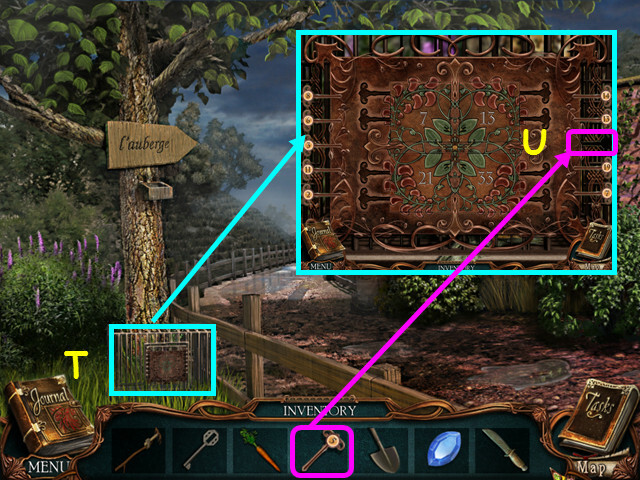 • Place the MOON CLOCK PIECE in the empty spot on the left to trigger the mini-game (K). 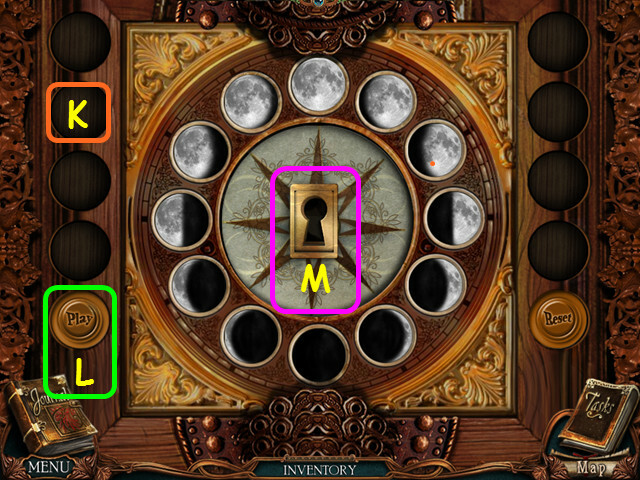 • Place the moons in chronological order, then press the ‘Play’ button to see if you are correct (L). 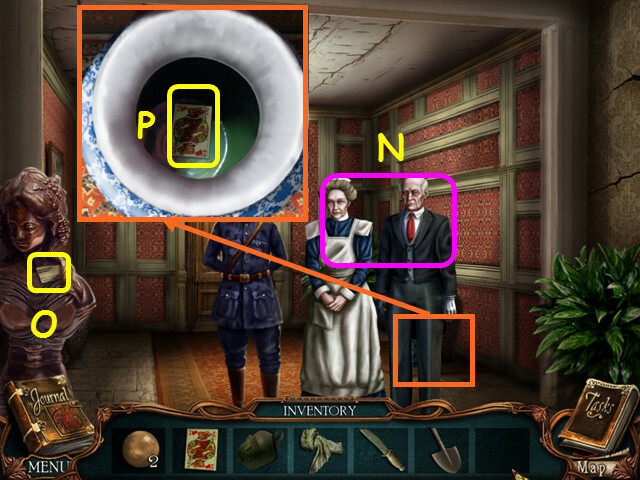 • Note the secret keyhole that appears (M). • Walk to the upper left hall. • Take a photo of the officer and caretakers (N). • Take the 1/8 LETTER PIECE (O). • Look in the blue vase behind the caretakers and take the 2/4 CARD (P). • Walk down, speak to Rouletabille, then go to the upper right hall. • Take a photo of Daddy Jacques (Q). • Take the NECKLACE (R). • Note Mathilde’s room (S). • Look at the chandelier and take the 3/4 CARD (T). • Enter Rouletabille’s room on the left (U). 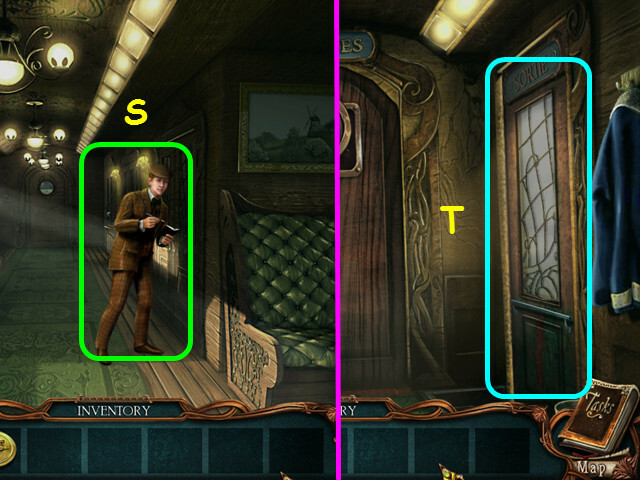 • Note the mini-game on the left (V). 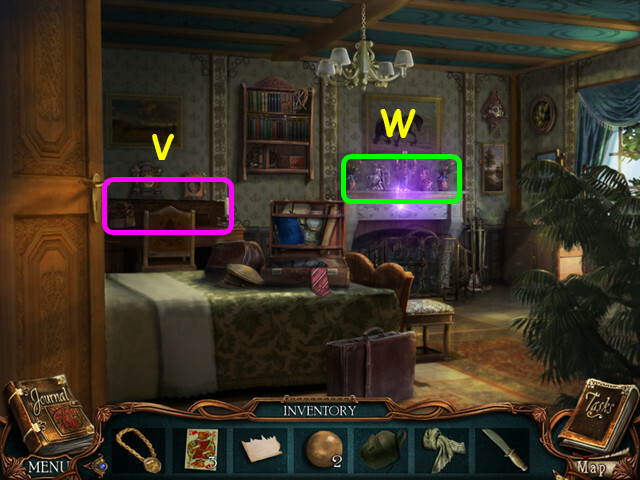 • Select the mantle for a HOS (W). 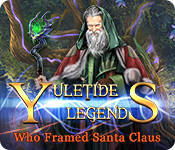 • You will earn the 4/4 CARD. • Look at the mini-game on the left. • Take a photo of the note (A). 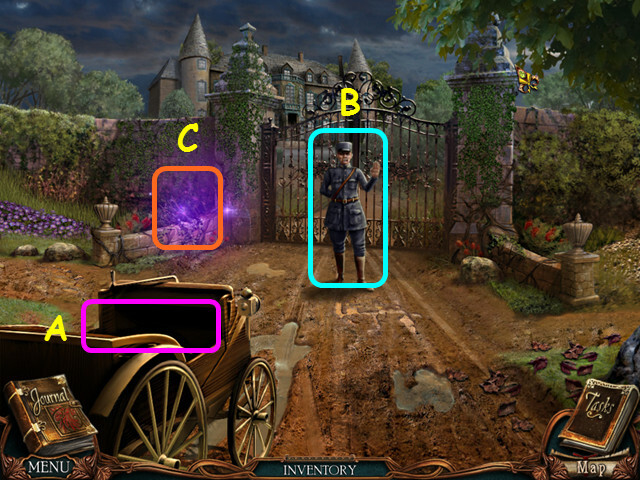 • Place the 4 CARDS on the board to activate the mini-game. • There is an error on each card; select the spot that is missing something (B). • Take the CLOCK KEY (C). 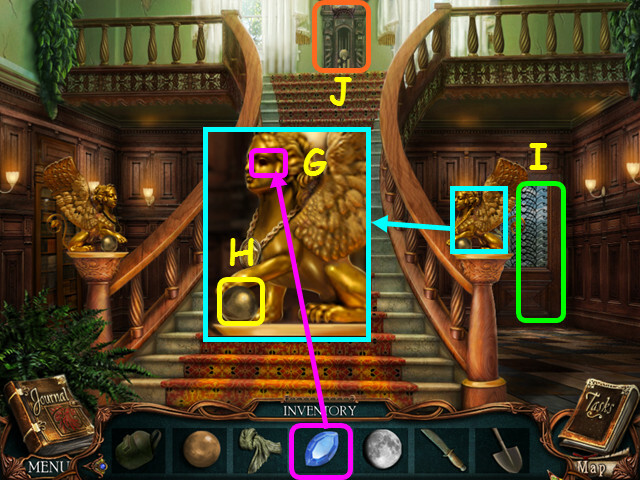 • Look at the griffin on the left and place the NECKLACE on its neck (D). • Take the 3/3 LEAD BALL (E). 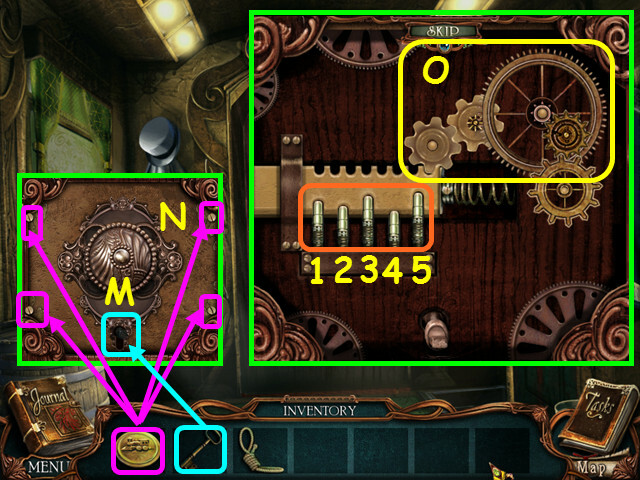 • Look at the clock and use the CLOCK KEY in the lock (F). • Take the BACK DOOR KEY from the compartment (G). • Look at the door and use the BACKDOOR KEY on the lock (H). • Turn the key, then use the door handle (I). • Walk out to the laboratory area. 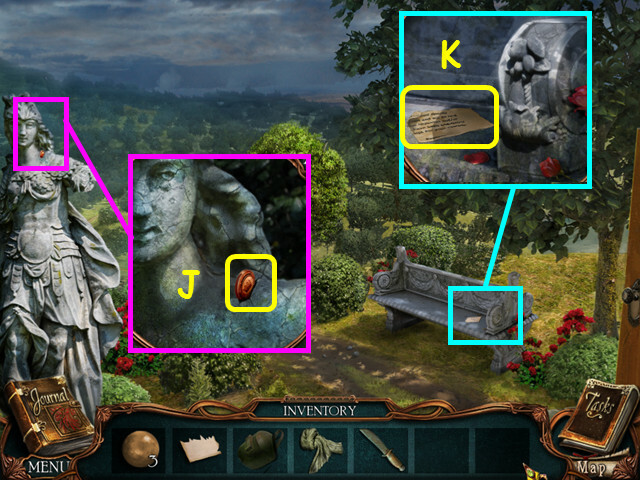 • Look at the statue and take the CHECKER (J). • Look at the bench and take the 2/8 LETTER PIECE (K). • Note the ladder (L). • Note the locked storage bin with the rusty lock (M). • Look at the table for a mini-game (N). 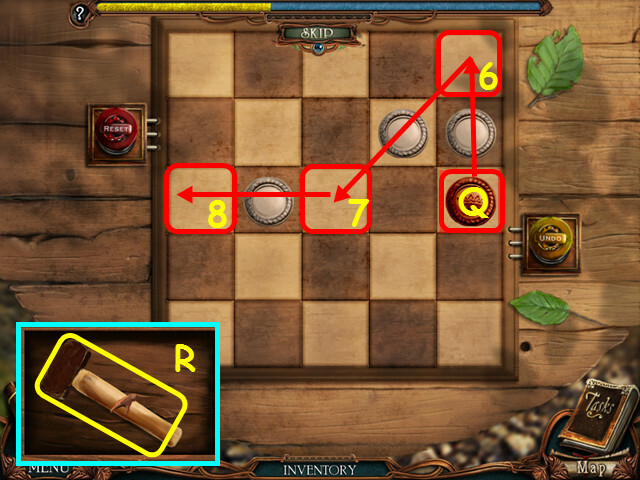 • Place the CHECKER on the board to trigger the mini-game. • You must remove all the white checkers from the board by jumping over them. • White can jump white checkers, but not the red checker. • Select the bottom center white checker (P) and have it jump the right center white checker (5). • Select the red checker again (Q) and make moves 6-8. • Take the HAMMER from the compartment (R). 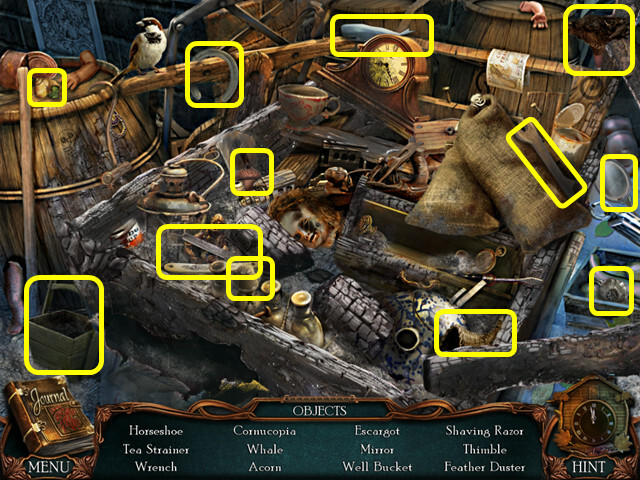 • Look at the storage bin and use the HAMMER on the rusty lock. • Select the storage bin for a HOS. • You will earn the 3/8 LETTER PIECE. 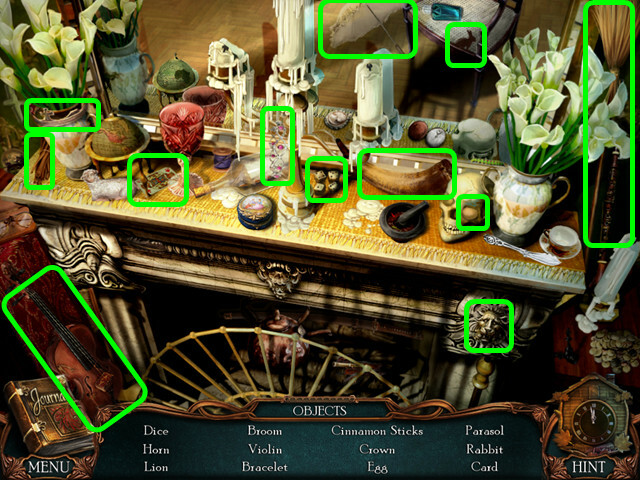 • Note the clock mini-game (S). • Note the door to the yellow room (T). 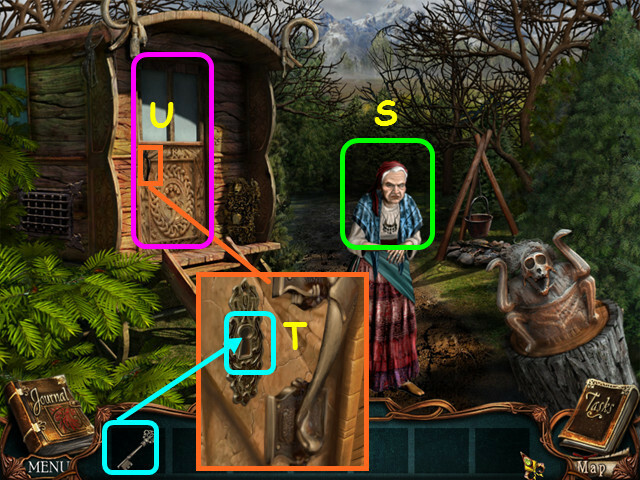 • Select the device for a mini-game (U). 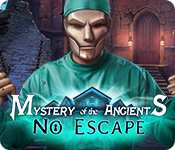 • Use the WELDING MASK on the device to trigger the mini-game. • Place a LEAD BALL on the prongs in the center (V). 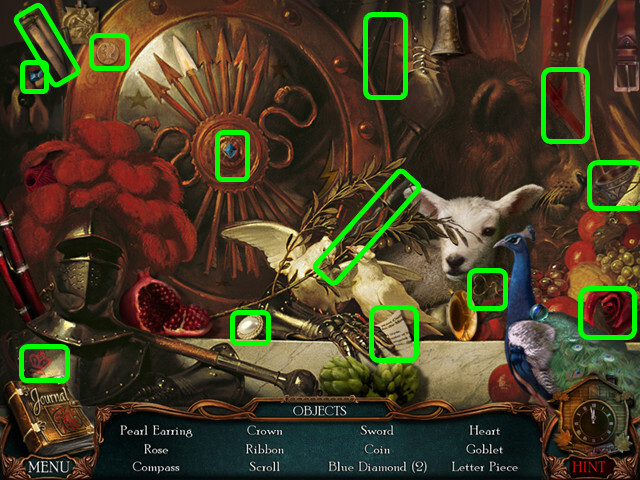 • Drag your cursor along the white dots to cut out a shape (W). • Repeat the process for the other 2 LEAD BALLS. • You will earn the HORSE, ROOSTER, and PIG. • Select the clock mini-game. • Place the tiles in sequential order to show the fish jumping out of the water (X). 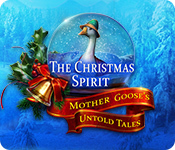 • Press the ‘Play’ button to see the movie and learn if you are correct (Y). • Take the 4/8 LETTER PIECE from the compartment (Z). • Enter the yellow room. 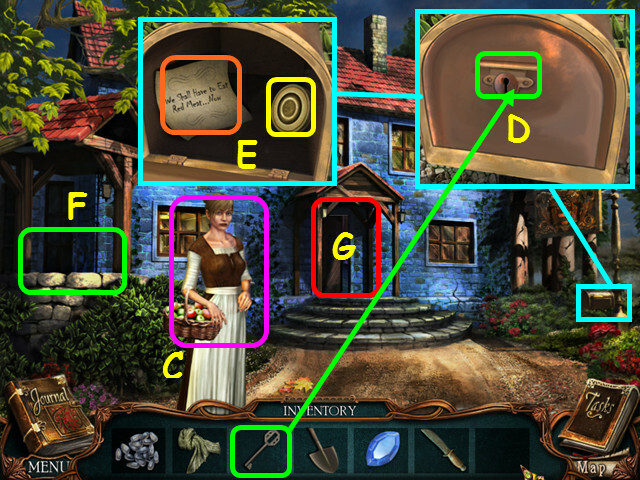 • Note the vanity has a place to reassemble the letter pieces (A). 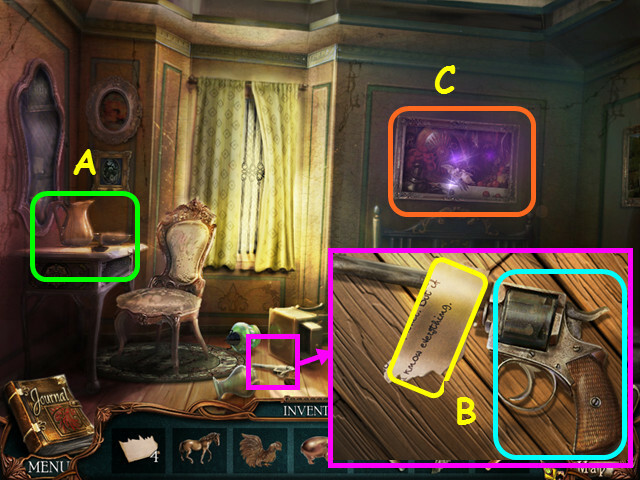 • Look at the nightstand; take the 5/8 LETTER PIECE and take a photo of the handgun (B). 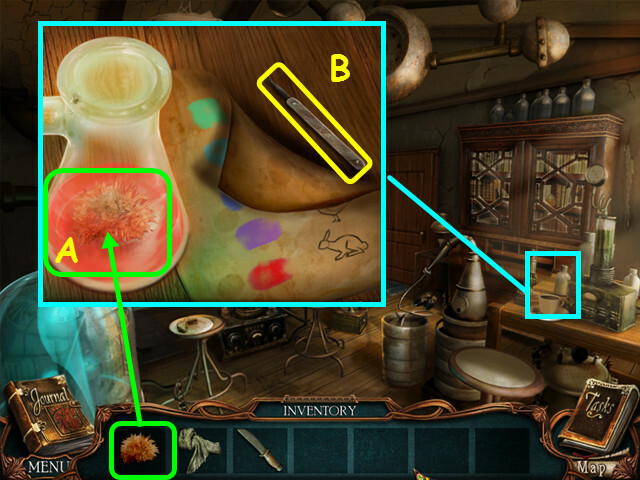 • Select the painting for a HOS (C). 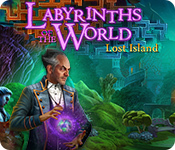 • You will earn the 6/8 LETTER PIECE. • Walk down 6 times, then go to the right. 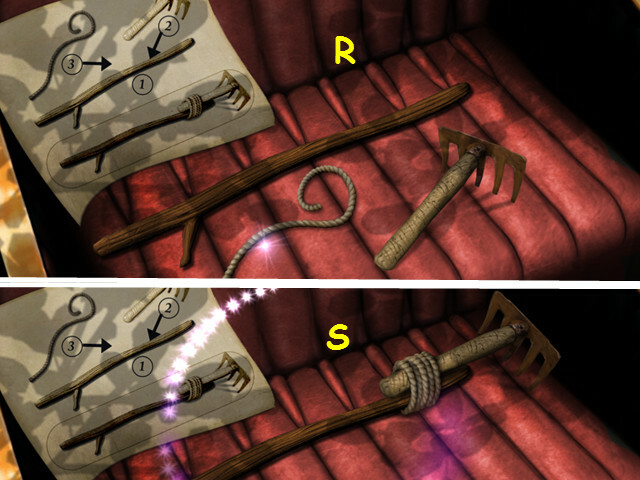 • Look at the stake holding the rope and use the SHOVEL to dig it up (D). 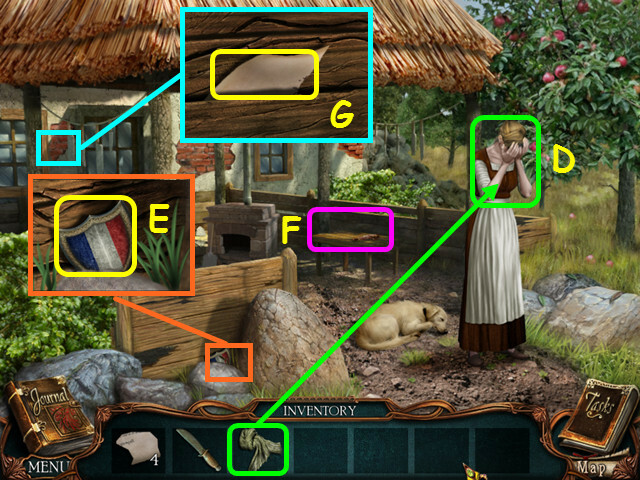 • Look at the fallen chest and place the PIG, ROOSTER, and HORSE on the lid (E). • Take the FUR and the 7/8 LETTER PIECE (F). • Walk down, go forward twice, walk out the back door and go forward 3 times to the yellow room. • Look under the desk and use the HAMMER on the loose floorboard (G). • Take the 8/8 LETTER PIECE (H). 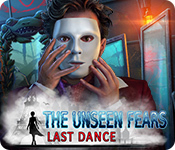 • Look at the vanity for a mini-game (I). 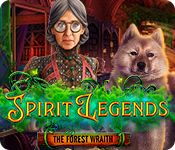 • Place the 8 LETTER PIECES on the table to start the mini-game. 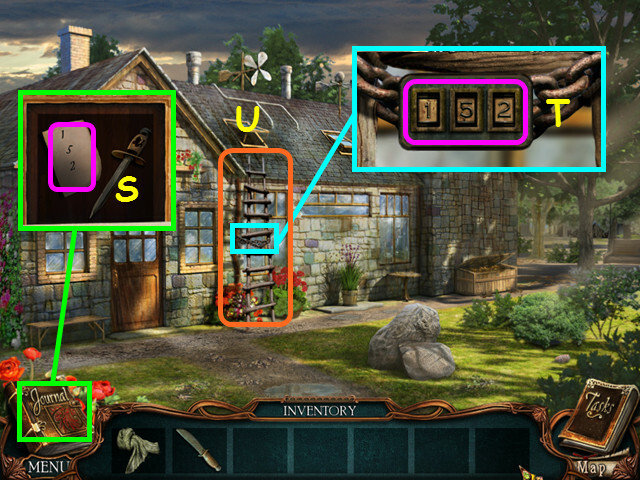 • Restore the letter jigsaw-style by dragging the pieces into position (J). • Take a photo of the letter. • Walk forward to enter the lab. 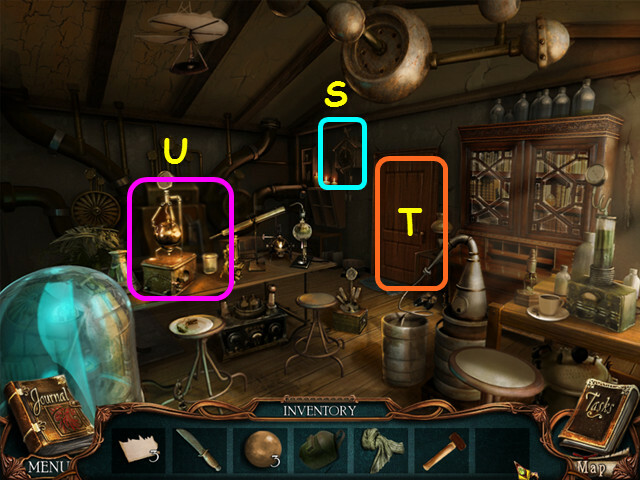 • Look at the testing apparatus on the right and place the FUR in the flask (A). • Take the LOCK PICK (B). • Look at the rock by the bench; photograph the note and take the 1/4 SLIDER (C). • Walk down to enter the chateau, the walk to the right hall. • Look at the chandelier and take the LIGHT BULB (D). • Enter Rouletabille’s room on the left (E). • Eavesdrop on the 2 men (F). • Select the mantle for a HOS (G). • You will earn the 2/4 SLIDER. • Walk down, then enter Mathilde’s room. • Look in the fireplace; take the TONGS and take a photo of the newspaper (I). • Walk down 3 times and go right to the garden. • Look at the branch and use the TONGS to take the MARBLE (J). • Walk down, enter the chateau, then go out the back door. Walk forward to the laboratory and go inside. • Look at the table on the left and use the LIGHT BULB on the device (K). • Take a photo of the ransacked table (L). 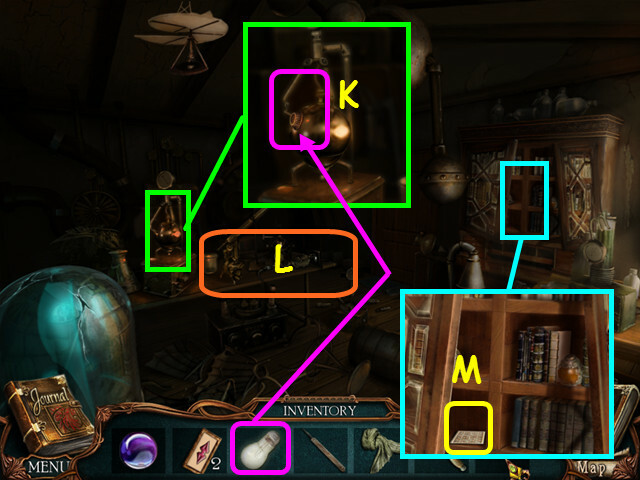 • Look at the bookcase and take the TAROT CARD (M). 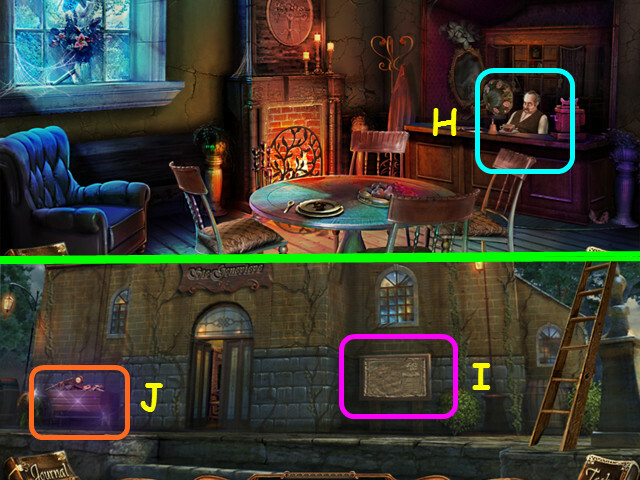 • Walk forward to the yellow room and select the painting for a HOS. • You will earn the 3/4 SLIDER. 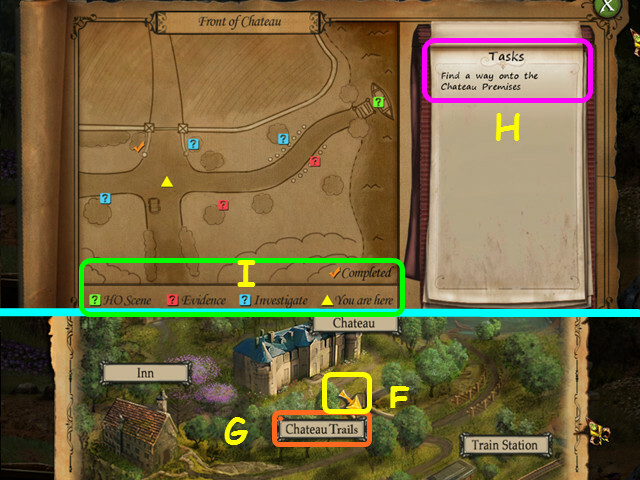 • Walk down 4 times to enter the chateau, the go to the left hall. 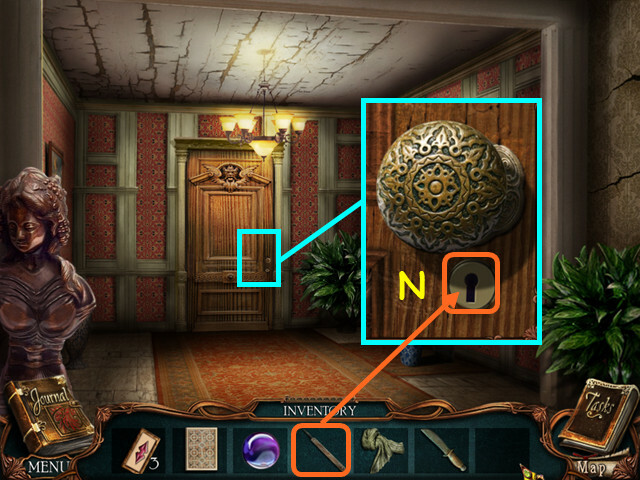 • Look at the door and use the LOCK PICK in the lock (N). • Look at the bust, place the MARBLE in the hole, and take the 4/4 SLIDER (O). 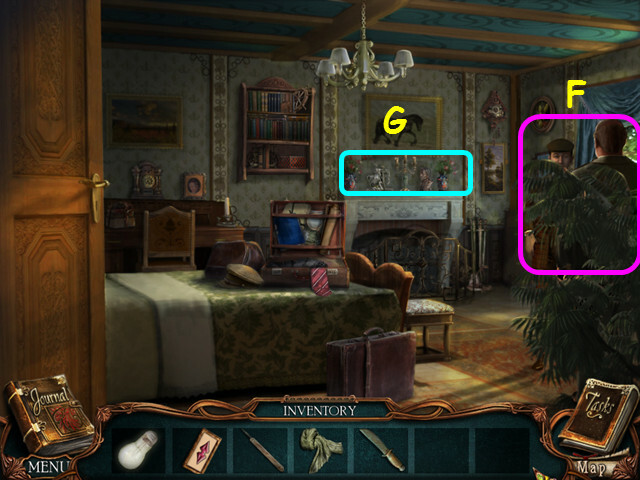 • Select the bed for a mini-game (Q). 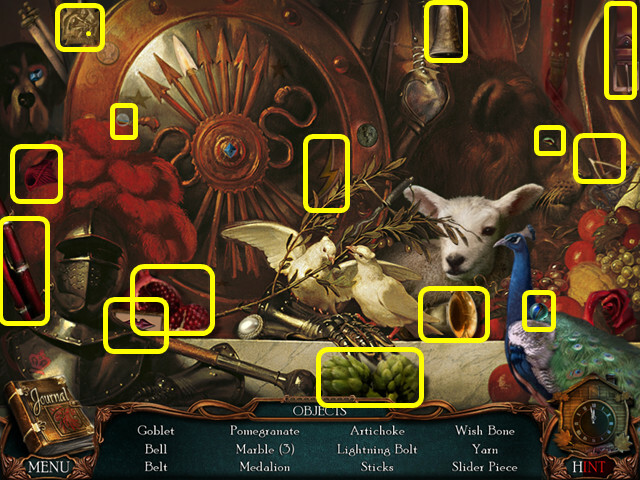 • Place the TAROT card in the empty space to trigger the mini-game. • Remove the cards by turning over matching pairs (R). 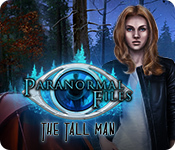 • This mini-game is randomly generated. • Take the SLIDER KEY. 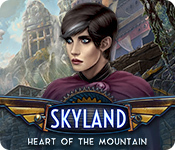 • Look at the chest for a mini-game. 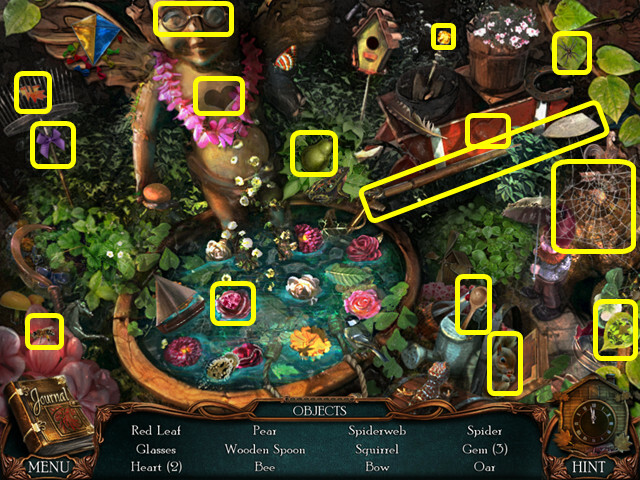 • Place the 4 SLIDERS on the board to trigger the mini-game. 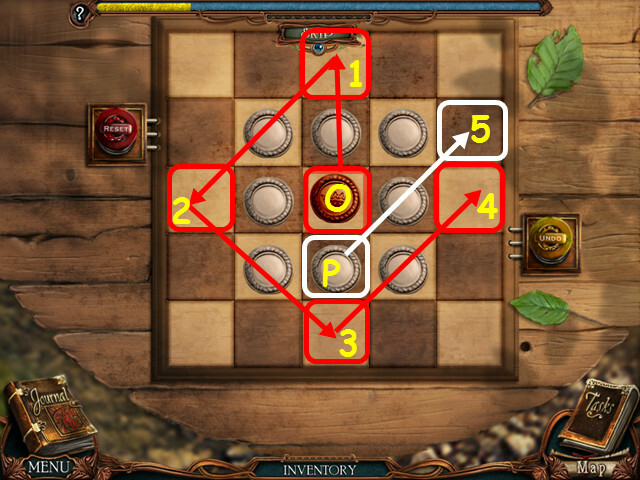 • Move the sliders so you can move the 4 corner pieces to the center. 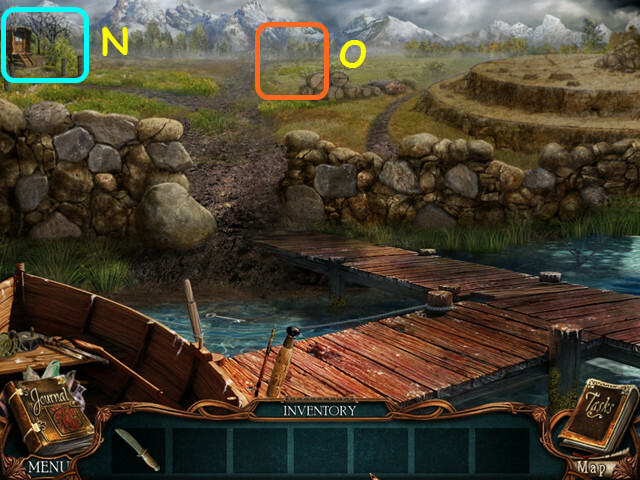 • Move the sliders in numerical order in the direction indicated (1-20). • Note that moves 18 and 20 move more than one direction. • Use the SLIDER KEY on the lock, then take a photo of the knife and code. • Walk down twice and speak with Rouletabille. • Go out the back door and walk forward. 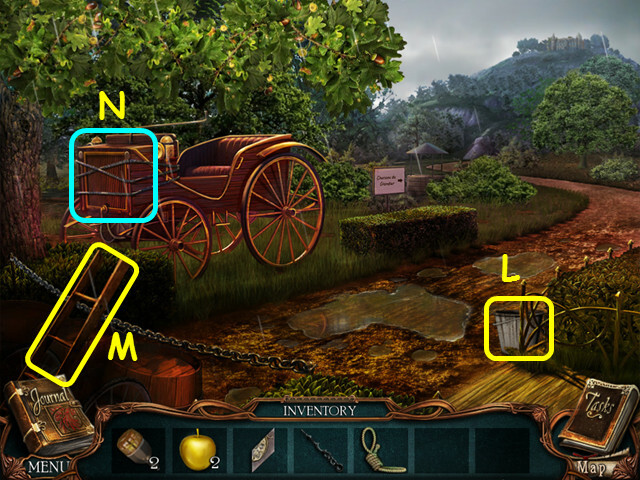 • Look at the chain on the ladder and enter the code from the slider box (S) on the lock (T). • Take the LADDER (U). • Walk down 3 times to the front of the chateau. 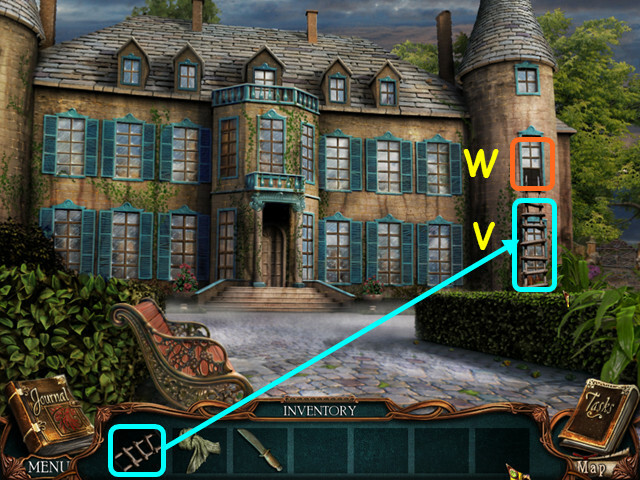 • Use the LADDER under Mathilde’s window (V). • Look in the window (W). • After the cut-scene, walk to the right. • Take a photo of Mr. Green (A). • Look at his hand and take the 1/8 NOTE PIECE (B). • Note the locked gate (C). • Walk down, enter the chateau, walk to the right hall, and enter Rouletabille’s room. • Take a photo of Rouletabille (D). • Look in the briefcase; photograph the threat and take the 2/8 NOTE PIECE (E). • Walk down 2 times, then go right to the garden. • After talking to Rouletabille, walk down 5 times to the front of the station. • Rouletabille will talk to you again. 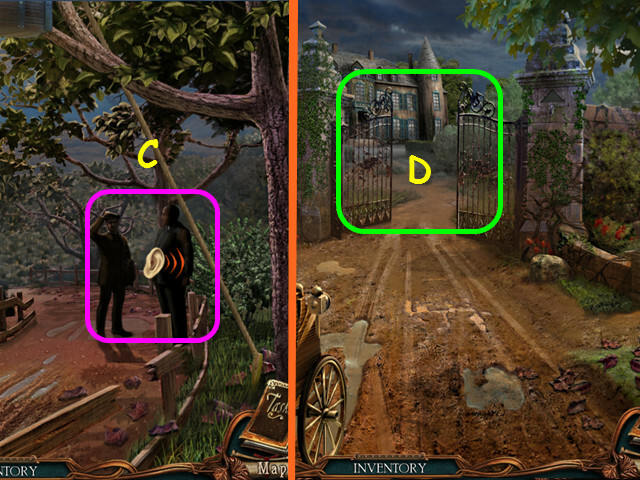 • Walk forward 3 times and select the bushes on the left side of the gate for a HOS. 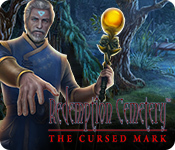 • You will earn the GARDEN KEY. • Walk forward, then right to the garden. • Look at the gate and use the GARDEN KEY on the lock. • Turn the key then walk forward. • Look at the mailbox; open the door and take the 3/8 NOTE PIECE (A). • Look at the bench and take the 4/8 NOTE PIECE (B). • Walk forward to the back porch (C). 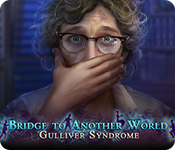 • Give the SCARF to the crying woman and she will give you the 5/8 NOTE PIECE (D). • Look at the rocks and take the CREST (E). 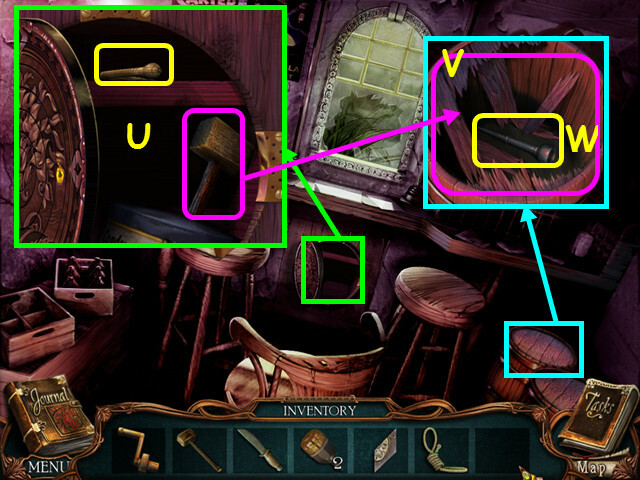 • Note the table where you can reassemble the note (F). • Look at the wall and take the 6/8 NOTE PIECE (G). • Walk down 3 times, enter the chateau, then go left and enter Larsan’s room. 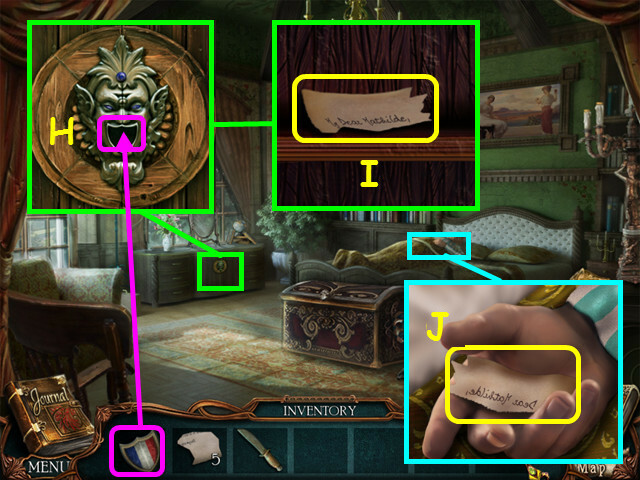 • Look at the dresser and use the CREST in the joker’s mouth (H). • Take the 7/8 NOTE PIECE (I). • Look at Larsan and take the 8/8 NOTE PIECE from his hand (J). • Walk down 3 times, go right to the garden, then forward twice to the back porch. 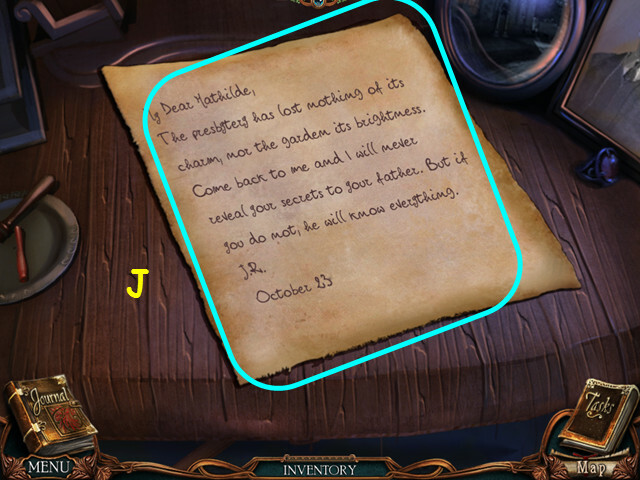 • Look at the table to reassemble the note. 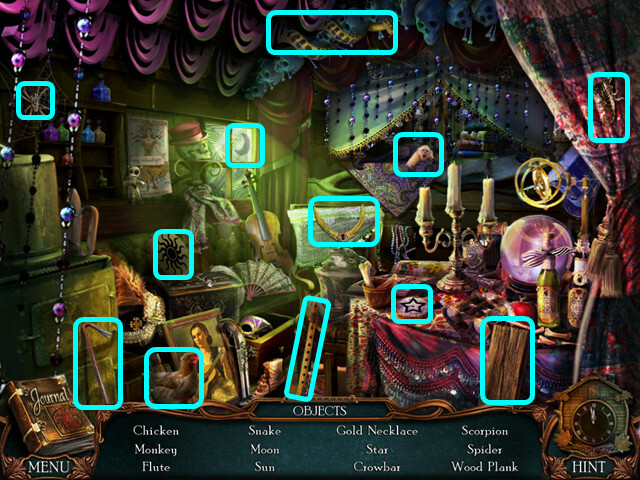 • Place the 8 NOTE PIECES on the table to activate the mini-game. • Restore the note by assembling the pieces jigsaw-style (K). • Walk down twice to return to the garden. • Select the fountain on the left for a HOS. • You will earn the OAR. 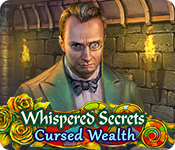 • Walk down once and Daddy Jacques will speak to you. • Walk down, go right, then forward and Larsan will speak to you. • Walk forward once more to the dock. • Look at the boat and place the OAR on the oarlock (L). • Go forward across the lake (M). • Note the Gypsy shack (N). • Walk forward to the cave path (O). • Take the FISHING NET (P). 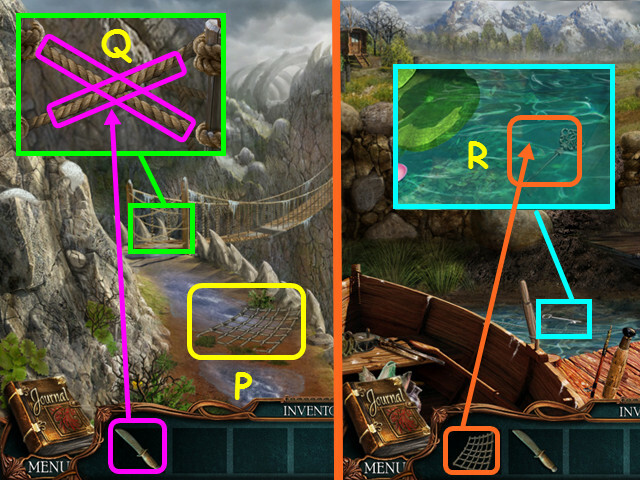 • Look at the end of the bridge and use the KNIFE to cut each of the 2 ropes (Q). 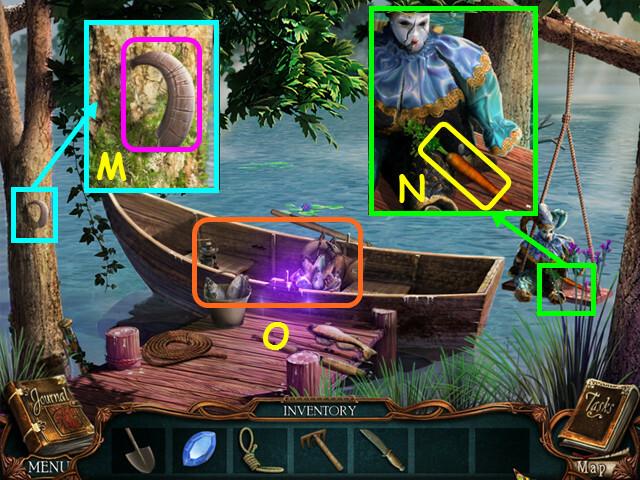 • Look in the water and use the FISHING NET to get the GYPSY KEY (R). • Walk left to the gypsy hut. • Take a photo of the gypsy woman (S). • Look at the door and use the key in the lock (T). 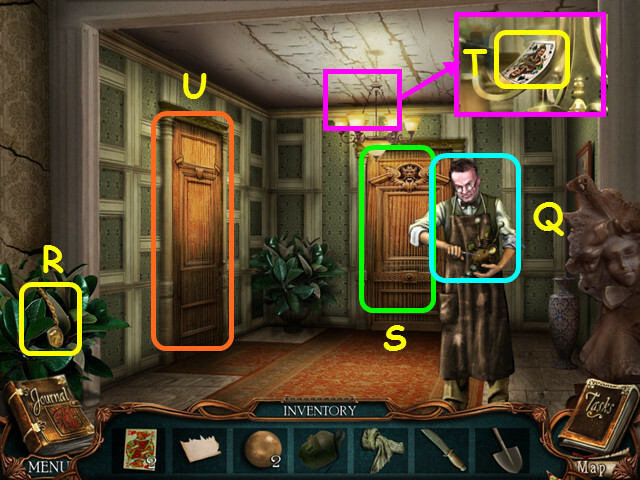 • Turn the key, then select the doorway for a HOS (U). • You will earn the CROWBAR and the 1/2 WOOD PLANK. 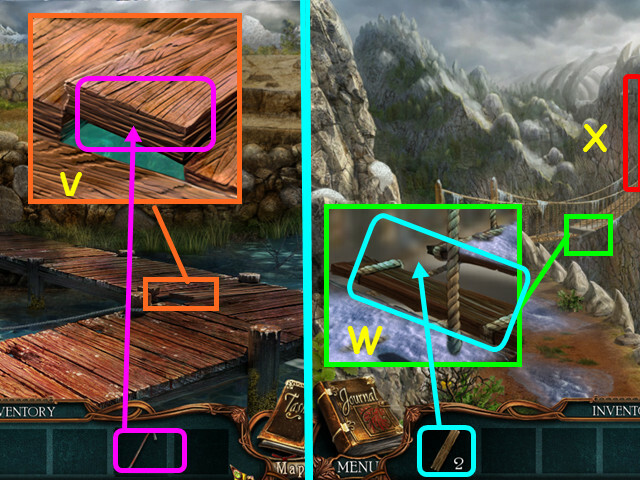 • Look at the dock and use the CROWBAR to take the loose 2/2 WOOD PLANK (V). • Walk forward to the cave path. • Look at the bridge and use the 2 WOOD PLANKS to fill in the holes (W). • Walk across the bridge to the beastie cave (X). • Look at the body frozen in the ground and take a photograph of the bullet wound (Y). • Walk down 6 times and walk forward to the chateau. • After talking to Daddy Jacques, enter the house, walk to the right, and go inside Rouletbille’s room. • Look on the bed and photograph the telegram (Z). 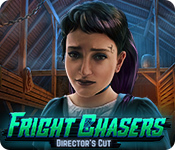 • After the cut scene, walk down 7 times to the front of the station. • After speaking to Rouletbille, walk forward 7 times back to the laboratory. • Congratulations! 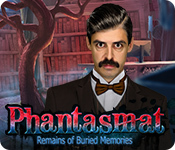 You have completed Victorian Mysteries: The Yellow Room!